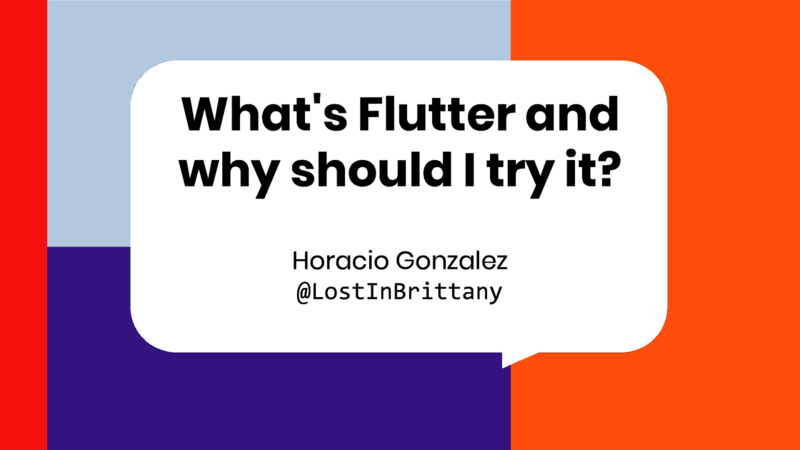 View What's Flutter and why should I try it? on Notist. What’s that Flutter everybody in mobile development is talking about these days? Another new thing that will be forgotten by this time next year or a true revolution in mobile apps development? Is it really worth my time? In this talk I’m going to introduce you to Flutter, Google’s mobile app SDK for crafting high-quality native interfaces for iOS and Android in record time. Flutter works with existing code, is used by developers and organizations around the world, and is a free and open source. O.K., I recognize that was the commercial pitch… but I am going way further that commercial pitch. I am going to show you the features that make Flutter one of the most pleasant and productive development platforms I’ve seen, I am going to show you how you can use Flutter to create beautiful UI with fewer lines of code and minimal boilerplate. And I will also show the points where Flutter needs improvement, and what the Flutter team and community is doing to address them.